You will likely have iOS devices on your network. 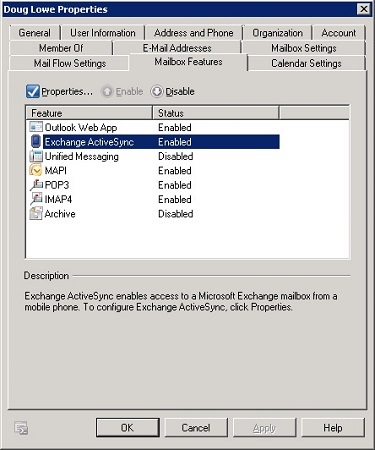 An iOS device can integrate with Microsoft Exchange email via the Exchange ActiveSync feature, which is enabled by default on Exchange 2010 and later versions. Choose Start → Administrative Tools → Active Directory Users and Computers. The Active Directory Users and Computers console opens. Expand the domain and then locate the user you want to enable mobile access for. Right-click the user and then choose Properties from the contextual menu. Click the Exchange Features tab. The Exchange Features options are displayed. Enabling Exchange ActiveSync for a user. Ensure that the Exchange ActiveSync option is enabled. If the options aren’t already enabled, right-click each option and choose Enable from the contextual menu. Repeat Steps 5 and 6 for any other users you want to enable mobile access for. That’s all there is to it. After you enable these features, any users running Windows Mobile can synchronize their handheld devices with their Exchange mailboxes.